It was December 25, 1914, only 5 months into World War I. German, British, and French soldiers, already sick and tired of the senseless killing, disobeyed their superiors and fraternized with "the enemy" along two-thirds of the Western Front (a crime punishable by death in times of war). German troops held Christmas trees up out of the trenches with signs, "Merry Christmas." "You no shoot, we no shoot." Thousands of troops streamed across a no-man's land strewn with rotting corpses. They sang Christmas carols, exchanged photographs of loved ones back home, shared rations, played football, even roasted some pigs. Soldiers embraced men they had been trying to kill a few short hours before. They agreed to warn each other if the top brass forced them to fire their weapons, and to aim high. A shudder ran through the high command on either side. Here was disaster in the making: soldiers declaring their brotherhood with each other and refusing to fight. Generals on both sides declared this spontaneous peacemaking to be treasonous and subject to court martial. By March 1915 the fraternization movement had been eradicated and the killing machine put back in full operation. By the time of the armistice in 1918, fifteen million would be slaughtered. Not many people have heard the story of the Christmas Truce. On Christmas Day, 1988, a story in the Boston Globe mentioned that a local FM radio host played "Christmas in the Trenches," a ballad about the Christmas Truce, several times and was startled by the effect. The song became the most requested recording during the holidays in Boston on several FM stations. "Even more startling than the number of requests I get is the reaction to the ballad afterward by callers who hadn't heard it before," said the radio host. "They telephone me deeply moved, sometimes in tears, asking, 'What the hell did I just hear?' "
You can probably guess why the callers were in tears. The Christmas Truce story goes against most of what we have been taught about people. It gives us a glimpse of the world as we wish it could be and says, "This really happened once." It reminds us of those thoughts we keep hidden away, out of range of the TV and newspaper stories that tell us how trivial and mean human life is. It is like hearing that our deepest wishes really are true: the world really could be different. My name is Francis Toliver, I come from Liverpool. 'Twas Christmas in the trenches, where the frost so bitter hung. "He's singing bloody well, you know!" my partner says to me. "God Rest Ye Merry, Gentlemen" struck up some lads from Kent. "There's someone coming towards us!" the front line sentry cried. As he bravely strode unarmed into the night. 'Twas Christmas in the trenches where the frost so bitter hung. Note: For an engaging movie based on this inspirational Christmas story, click here. For an article in a leading U.K. newspaper on one of the last survivors of the Christmas Truce, click here. 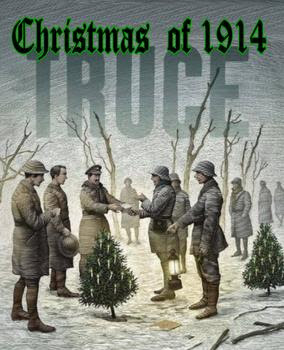 For more on the history of the Christmas Truce, click here and here. For a highly decorated U.S. general describing how wars are waged largely to fill corporate coffers, click here. For several other inspirational Christmas stories, click here. Share this inspirational Christmas story with your friends and bookmark this article on key news websites using the "Share" icon on this page.